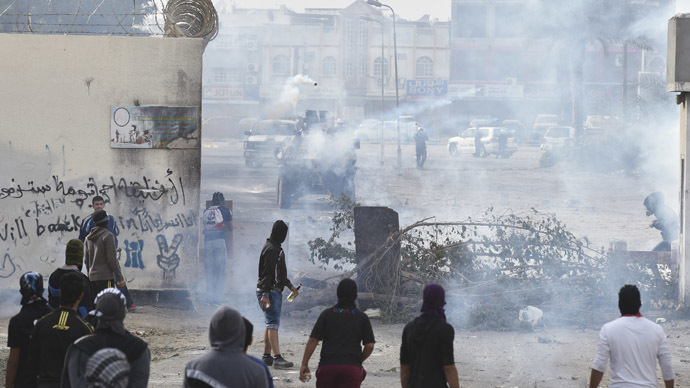 Bahraini police fired tear gas at hundreds of Shia protesters who took to the streets on Saturday, on the fourth anniversary of the Arab Spring uprising, supporting the opposition, whose leader is currently behind bars. Carrying national flags, as well as portraits of detained activists, people chanted “Down Hamad”, referring to the Sunni king, witnesses said, according to AFP. They burned tires and blocked village roads with rocks, garbage containers and branches. Heavily deployed police fired tear gas and sound bombs in several villages and along major roads across the country. Although no casualties have been reported, images of various shotgun injuries of Bahraini protesters appeared on social media. Base of the US Fifth Fleet and a Western ally in the fight against the Islamic State (also known as ISIS, or ISIL), Bahrain saw major Shia protests in February four years ago, but they were cracked down by Saudi-backed authorities, who support the Sunni minority. The political divide in the country got even deeper when the opposition leader Sheikh Ali Salman was arrested last December, as he boycotted parliamentary elections. Salman was re-elected head of Bahrain's main opposition party Al-Wefaq, so his detention sparked protests across the country, which were marked by clashes with security forces.